Discover the newest hair trends proposed straight from the runways, asymmetrical lengths and romantic boho styles to let your creativity fly when styling your hair. Unconventional, rebel and unique as only you want to be. 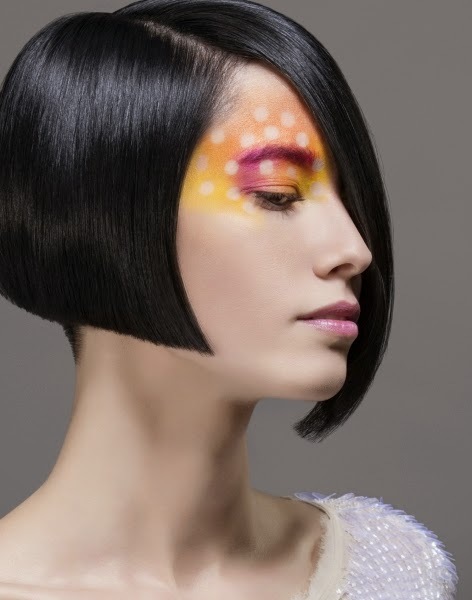 Graphic cut: like this dark bob with an extra-long fringe with some magic make-up in eclectic sunny yellow and pink with dots. Asymmetrical hair styles combined with denim outfits and accessories, for a total look of pure sexiness. Retro sixties short cuts and gelled dandy-girl looks. The ultimate blond hair color of the dreamy jean stars: bobs in pastel blonde and out-of-bed layer looks. Bold Blond: The asymmetrical graphic cuts are experimental, radical and rebellious. The glam style meets eccentricity with these young and hip short cuts – graphic or with a lot of volume – are the trends for club fashionistas. Very urban, rock and above all blond. Plaited and twisted: oversized retro quiffs become opulent fashion works. The casual romantic boho styles are more tousled, with a few strands of hair pulled out, for extremely stylish look but never too sweet.for a remarkably exciting power.